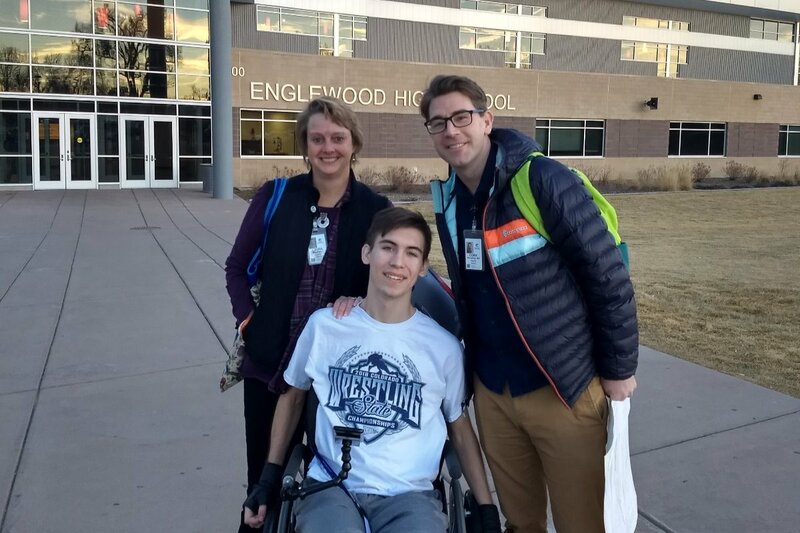 Everyone’s friend, 16 year old College Park High School Falcon sophomore Ryan Joseph, son of Kristin and Tom Joseph, suffered a life changing spinal cord injury in a wrestling meet on Wednesday, January 10, 2018. Currently Ryan is paralyzed from the neck down and unable to breathe on his own. Hopes and prayers are for Ryan to have a speedy recovery and one day regain mobility for independent living. Ryan is being well-treated at the John Muir Trauma ICU in Walnut Creek. Unfortunately, he is unable to receive visitors at this time, but cards are welcome. 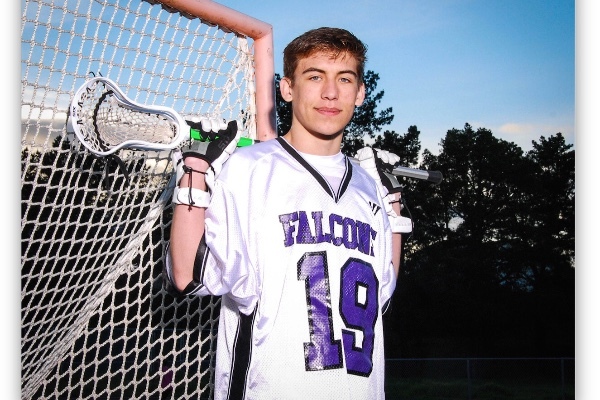 Ryan is well known by friends, teachers and coaches for his charm, exceptional wit and humor. 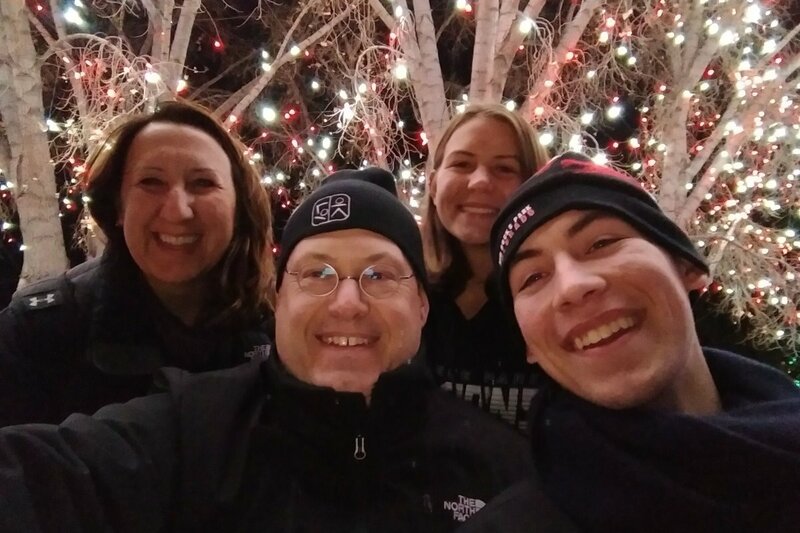 His family gives heartfelt thanks for the kindness and support they have received from the many communities Ryan has touched at College Park High School, Pleasant Hill Middle School, and Pleasant Hill Elementary. Special thanks to his beloved wrestling and lacrosse teams. Please help support Ryan in his time of need! This will help his family with medical expenses, rehabilitation, and home accessibility. 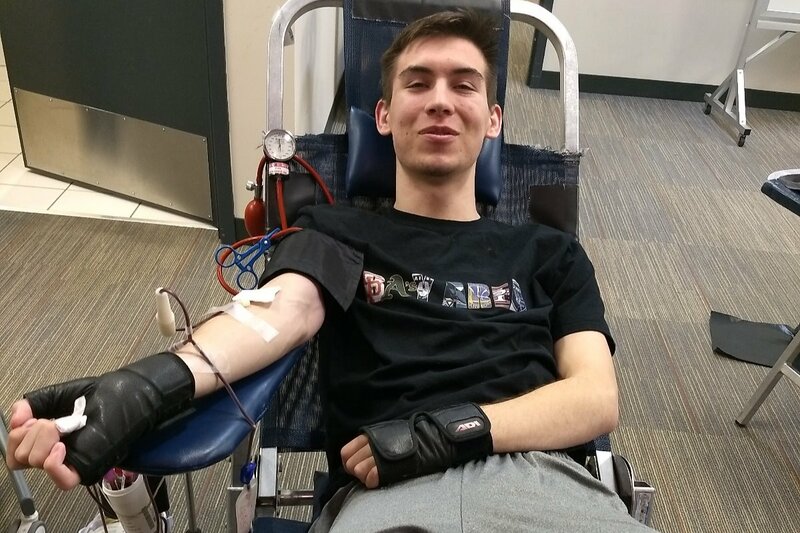 It has been a good few months – we survived our first blizzard (or bomb cyclone) and Ryan donated blood at the Engelwood HS blood drive (#IFightWithJohn) – yes, he still bleeds purple! Ryan was cleared to walk around as much as he can with his forearm crutches and he also got his first taste of lacrosse since his accident. Catching came back fast, he is still tweaking his throw, and moving in his chair and throwing & catching all at once may take a few more sessions! Thanks again to all of you who continue to reach out and send us love and encouragement – we miss home and friends and can’t wait to see everyone soon! This never gets old to me (but I'm his mom)! I just wanted to share some of the progress Ryan has made this month. He is still working on the mechanics of walking, but we are so happy he has the opportunity to work on his technique in so many different ways and settings. We have an awesome team of therapists and trainers that work with him every day. Many thanks to our Go-Fund-Me group for making this continued therapy possible! Thankfully, Ryan has checked those items off his list and is now working hard on the mechanics of walking. As strength and signals return, things just get easier. Perfect? Nope, but improving every day! Specifically, Ryan is strengthening his glute medes (part of the gluteal muscle family) that will help to flex and rotate the hip, which is a major part of walking. 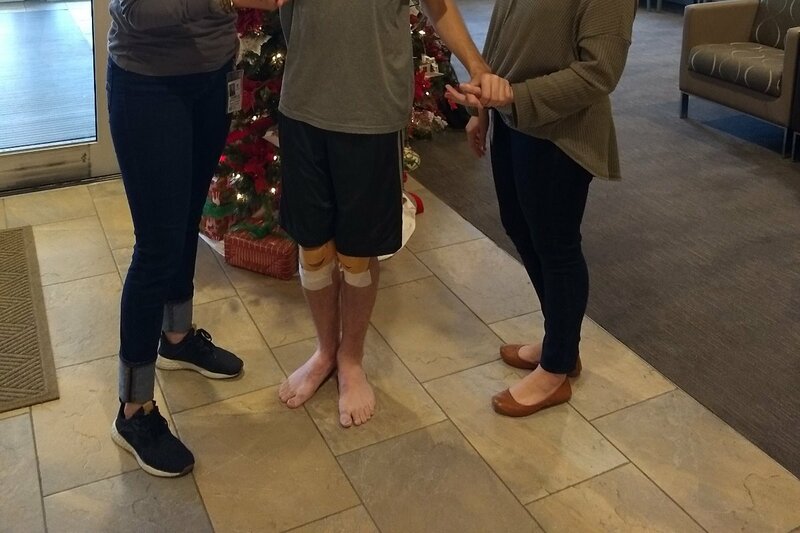 Most days you can see Ryan walking barefoot in the therapy corridors using a variety of walking aids including platform walkers, regular walkers and even using a shopping cart some days for stability. Each method challenges him in a different way, and his therapists use a variety of methods to assist with getting each step right. Some days he might be walking with electrical stimulation to give his muscles cues or he may have just had a “dry needling” session to relieve/reduce muscle tension/tone in his legs or core to get a better response to therapy. Ryan is also working on finger flexibility and getting his hands and fingers to work better. He has some movement, but more movement is always helpful. All the little improvements lead to the larger ones. In addition to the physical aspects of this injury, we have learned that attitude is everything, and Ryan remains positive, hopeful and strong. Ryan starts school at Engelwood High School today. MDUSD was not able to keep him on the books to continue his classes through College Park, so Ryan is enrolled at Engelwood HS and will participate in classes while still in therapy. We are very optimistic, the Engelwood team has been very welcoming, creative and flexible in their approach to his education and we are looking forward to a great first day. He will physically attend school for Honors Chemistry and Honors Algebra II and then coordinate with his Engelwood and Craig teachers for English and AP American History. It is a packed schedule for sure, but he is determined to keep up with school. We don’t have a specific date in mind yet to come home. We have been gauging home on Ryan’s progress, and as he has continued to move forward, our date to come home has been extended. We have been told that the first year or two are the most critical in terms of rehabilitation as the body heals and signals are regained. We have a unique opportunity to be at the one of the best spinal rehabilitation facilities in the country and we are taking full advantage of what they have to offer. This year we have been the recipients of great kindness, support and love both large and small, and ALL very much appreciated. It can be easy to feel disconnected from things at home since we are away, but we have a very dedicated group of people who have made sure that does not happen, and we can’t thank you enough for that. Ryan has never been a big social media guy, and the accident has not changed that. He reads all the messages and appreciates them very much. We are looking forward to another great year of progress! Happy Holidays! We have some videos and pictures to share from the last few weeks. 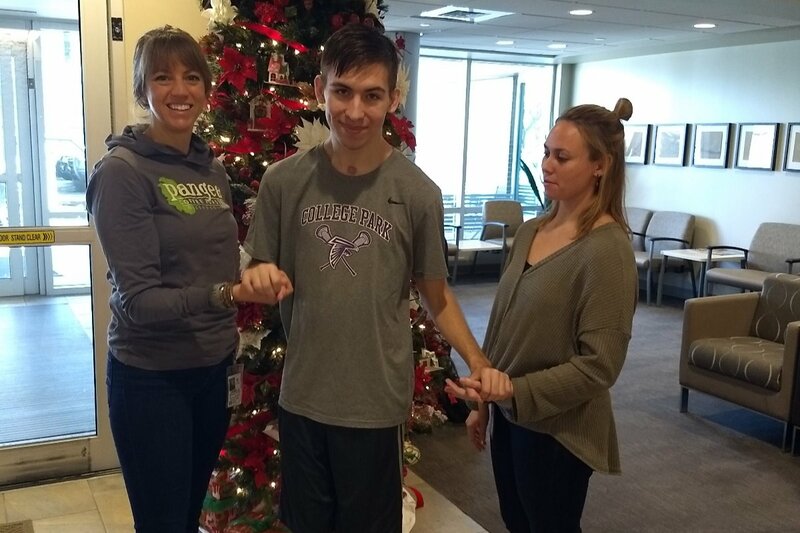 It seems like Ryan has turned another corner, his walking is stronger and he has been relying less on the walker to walk and more on therapists to hold his hands and provide some balance. Much to Ryan’s horror, walking barefoot in therapy has proven to be a game changer (“Mom, we live in a society…”). Ryan prefers the sophistication of at least a flip flop when walking in public. Apparently, walking barefoot provides a lot more sensory feedback to his system and it seems to be working. 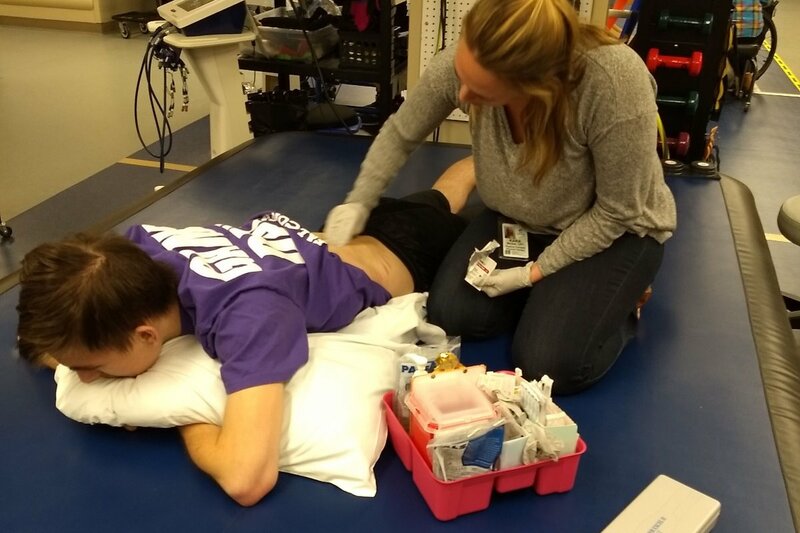 His PT, Kara, has been taping him up and doing dry needling, and he has been a walking machine the last few weeks! We are excited to have Dad, Tom, and sister Haley, here for the winter break. Ryan was asked if he wanted to take time off from therapy over the next two weeks, and his answer was “Nope, that’s not what I am here for”…GAME ON! Have a happy and safe holiday! !